Comfort and protection are key factors when choosing which cushion to use. Whether the needs are short-term or otherwise, the best seat cushion is one that helps the user and provides the most comfort. The EquaGel General Cushion is able to do both. The General Comfort Pad is a 2-inch thick, two layer pad that is great for moderate pressure therapy. 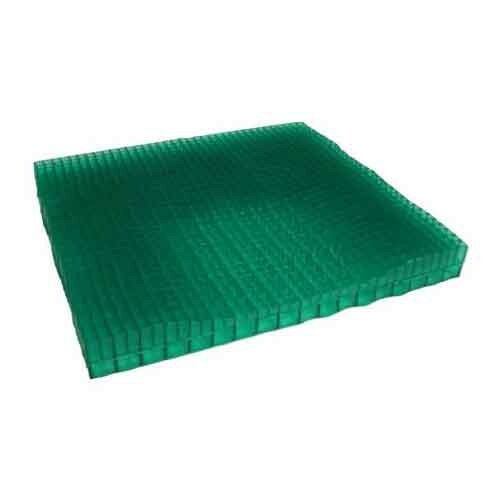 The top layer acts like a thin gel wall that uses a tight grid-like pattern. These two features provide a layer of comfort and support. The bottom layer works like a thick layer of protection and uses a wider grid-like system to sustain comfort and support during usage. A pelvic area is added to the General cushion as well. That region is 3/4-inch deep, protecting the pelvic area and dispersing the weight more evenly throughout the cushion. The EquaGel itself is a dry-polymer gel that feels like rubber but acts like a polymer material. This unique material is able to provide plenty of comfort while not being very thick at the same time. It's also extremely flexible thanks to it's "column buckling" feature, spreading out the weight distribution as more is added toward the center of the frame. The process is repeated until the maximum amount of space is used per gel cushion. Once all of the pressure points are used, you'll notice a much more comfortable experience. Extremely Flexible Thanks to "Column Buckling"